Wow! Here we are in March already. Where has the time gone? No matter, spring in just around the corner and I don’t know about you but I could use a little something new to lift my spirits. However, I want what I am working on to be able to serve multiple purposes. So, for our first ever Craft of the Month we will be creating a decorative container out of old materials around our home. I am using old barn boards from a building we took down here on the homestead. This has been great, as there is no cost, but bad in the sense that it has added challenges due to the age of the wood. Let me also add that while I plan to use this structure for many things, you can make your own uses as well. It is a very open ended idea for any type of decoration. I am planning to use it at Easter by putting decorative grass in with a few of the treats the Easter Bunny may be dropping off. I also plan to use it to start some simple plants in before they are headed out to the garden. Other options can include a napkin holder, condiment container, or kids craft container. So without further hesitation here is how it works! First, find some old wood around home. It seems we always have this stuff. If you have newer wood you can also paint it the way you would like or stencil on your family name. 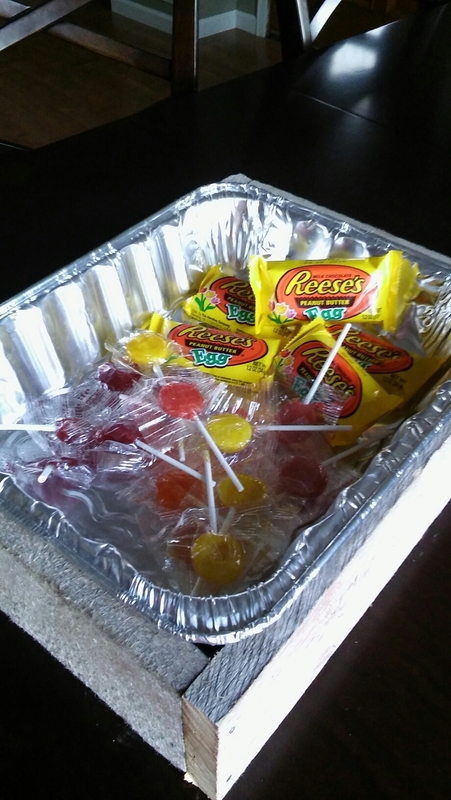 Purchase an aluminium disposable baking dish- I was able to get a set of two at the dollar store and this one was left over in my cabinet. Measure the edges of your baking dish against your wood and draw your lines (be sure to put your lines on the inside of the board, so not the side people will look at). Measure the width of your board and add that to one end of your longer boards. This will compensate for putting the pieces together so the pan will fit and not rest to high in your container. Using a saw cut your pieces of wood on the lines you created. Be sure to measure twice, cut once if this is your first go with woodworking. Here was my hazard of using reclaimed barn wood…splitting. I have extra wood use still. If you have fancier saws you could cut your wood at 45 degree angles to have the corners flush up perfectly. I only had a portable saw so it was not going to happen here. Then take your pieces of wood and arrange them. Be sure everything is fitting nicely and that you are satisfied. Also make sure before you start nailing them the correct sides are facing outward. Finally, using a hammer and a few small nails, again left overs floating around the tool area, hammer the pieces together. Take your time to ensure your edges are straight with one another. Place it in a well loved location, put your pan in and fill it up with your own bit of happiness. Don’t be afraid to rotate the pan contents-versitility is key to this being so great. Enjoy! Tell me what you think of this project or feel free to comment creative ideas you have to fill it up too. Awesome idea! Your kids are outside a lot so I’m sure they could use it for seed starting, collection containers or just a good old fashioned sand pit too. Tractor Man is into dinosaurs so he will be digging ‘bones’ next week.